There are only two things to be said about claims of "unlimited". First, there is no such thing. Honest! Read the fine print of the contract that you will sign (or agree to if you don't actually physically sign a contract), and you will see that there are caveats, limits, provisions, terms, conditions, etc., all outlining exactly what is included in your "unlimited" bandwidth or disk space or number of email accounts or processing cycles or whatnot. Something is limited. It may not be your disk space or bandwidth or number of email accounts, per se, but there will be something that will, in effect, place some sort of limit on your account, effectively limiting a number of resources, not the least of which are the aforementioned disk space, bandwidth, and the number of email accounts you can have. If you use excessive amounts of any resource -- or, as is becoming popular with deceptive hosting companies, use too many resources in too short a span of time -- your hosting company will either charge you more, force you to upgrade to a more expensive hosting plan, throttle your site, or simply close you down. It's there in writing, dammit! Read it! The fact is that your hosting company pays someone else for things like bandwidth and disk space (no matter where they are in the food chain, they have to buy resources in one form or another from someone else), and they will not lose money just so that you can keep your $4.95-per-month hosting account online. Just ask yourself this: Do you really think that Google uses an "unlimited" shared hosting account with some cheap hosting company? What about a big, multi-national, non-technical company like Coca Cola? The national government in your country? Nah, didn't think so. The second is very simple. Look at the image below to see exactly why nothing is "unlimited", even in the hosting and domain-registration business. Earth is only so big -- i.e., there are limits to it -- and so there are limits to everything, including your hosting package. 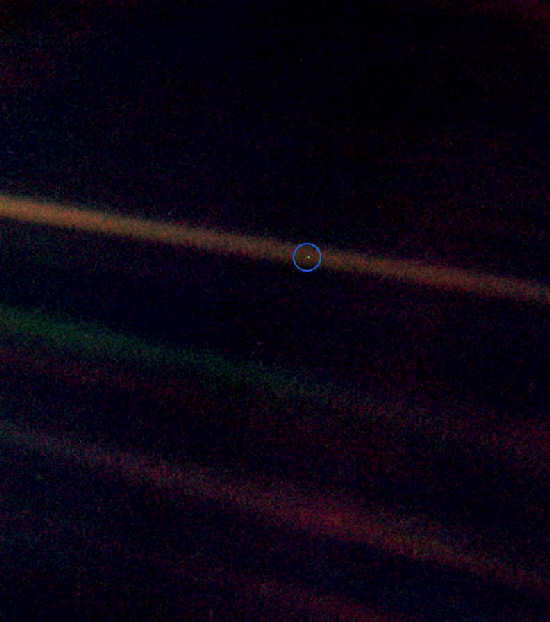 This is a picture taken of the planet Earth in 1990 by the Voyager 1 spacecraft from a distance of about 6.5 billion kilometres, or 4 billion miles. Can you see our planet? Without the aid of the blue circle, you'd probably have a hard time finding it. Does anything about this picture of the planet on which we live look "unlimited" to you? The Little ISP that Couldn't (cached copy, PDF, 77 kb): Blueberry Hill Communications, Inc. dba 4Domains went out of business in October 2010. Snopes also recently (as of 30 November 2010) removed their rant about Blueberry Hill, which is unfortunate as it was instructive, and of all people I'd have expected Snopes to maintain that sort of information for posterity. You lying Bait and Switch bastards: Another hosting customer gets screwed by the "unlimited hosting" lie. Amazon has killed off its unlimited data storage deal: 'Nuff said. Picture courtesy of NASA. More information on this picture, entitled Pale Blue Dot, is available on Wikipedia. This page (www.hostmysite.ca/gotchas/unlimited_hosting.php) last updated 2017-06-09 06:02:42 UTC.